Koi come in a variety of colors and types, including orange, red, Gin Rin, and white. But one of the hottest new colors to be bred in these fish is black. Black colored koi, which are referred to as sumi, are distinct from other koi, in ways which extend beyond their color, and as such require specific needs. All modern koi originate from the Magoi, which come from Asia. Both in China and Japan the Magoi were considered standard carp, and would sometimes showcase a slight bronze coloring, and occasionally white or orange. Authentic black koi will display a coloration which is jet black and deep, with very little color on their bellies. They are a koi strain which has been developed over time and which are called Karasu. Karasu, or Karasugoi, are the only true black colored koi, and Japanese breeders have produced them for quite some time. However they were largely unknown in the West in recently. Some say that the Japanese developed them just after the Second World War, while others claim that their breeding predates it. As such, the true history of this variant has become the subject of conjecture. What is known is that the breeding of Black colored koi spread from Japan to Indonesia and the Philippines. The color black has considerable historical significance in a number of cultures, including Asia. In some societies black represents power, sophistication or seduction, but in others it can be seen as malevolent, being associated with death, pestilence or the occult. To the Japanese, who originally bred them, adding black colored koi to your pond will bring about good luck. 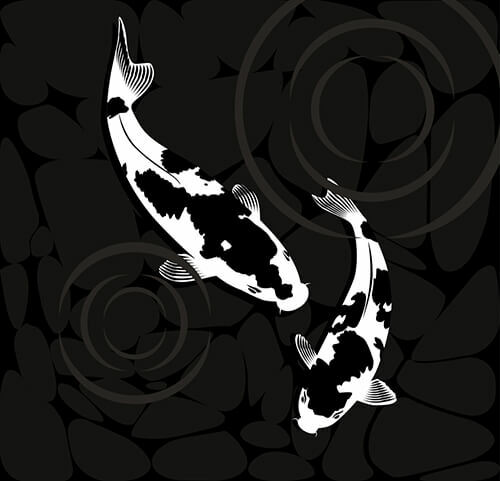 In fact, some Japanese see black koi and the black color in general as being capable of absorbing energy which is negative, while promoting contemplation and the overcoming of obstacles, as well as bringing wealth and prosperity into one’s life. Adding black koi to your pond or water garden will make it more interesting, as their color will be a sharp contrast to the other fish. When purchasing Karasu it is important to make sure they are free of cuts, abrasions or fins which are torn. Look for those that have strong and deep coloration, preferably jet black. The belly of these fish should be especially dark, with no coloration whatsoever. When black koi have sufficient room they will grow substantially, and can reach a size of 3’. They are superb eaters with a strong appetite, so you will want to make sure you have plenty of food on hand. They are good for hand feeding, and have exceptionally long lifespans of up to 30 years or more. This makes them an outstanding investment especially for those that want show quality fish. Remember that these fish should always be kept in numbers which are odd.